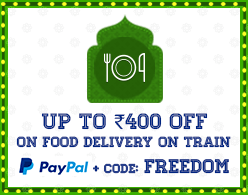 PDS Foods located near Ahmedabad Junction is the most preferred choice of RailYatris' to order food in train. Order now from PDS Foods & have a yummy journey! Happiness comes in Special Mini Size too. Grab on this thali which comes with seasonal veg, 3 plain paratha, veg pulao and pickle. The dishes are made with clean and healthy ingredients. This authentic Veg thali comes with paneer veg (100g), seasonal veg (100g), dal (100g), jeera rice (150g), roti (3 pcs) and sweet (1 pc). Enjoy! This authentic Jain thali comes with paneer veg (100g), seasonal veg (100g), dal (100g), jeera rice (150g), roti (3 pcs) and sweet (1 pc). Enjoy! Treat on the goodness of fresh and tasty mix seasonal veg with soft butter roti (3). Tadka dal and jeera rice combination is a choice of every travellers. Delicious! Enjoy a mouth-watering twist with this soft paneer butter masala (150 g) that goes well along with butter roti (3). Make your journey simply tasty. Nothing can beat the flavours of these yummy aaloo paratha (2 pcs) which is served with fresh curd. Enjoy! Feel like home away from home and treat yourself with flavoursome sabzi and soft, crunchy pooris. Enjoy your meal! Enjoy South Indian combo with soft idlis (2) and crunchy vada (1) served with chutney to tantalize your taste buds. Enjoy the yummy and freshy prepared poha, tempered with indian spices to add that extra zing. Cannot stay away from ordering this one. Also kown as Thayir Saaadm, this South Indian curd rice is a meal enough to tantalize your. This mouth-watering and juicy Kadhai Paneer (250 gm) is a delightful treat for your taste buds. Get ready to indulge in paneer cooked with masala and gravy. The delicious tadke dar dal (250 gms) sauted with whole cumin seeds have a slightly nutty flavor. A perfect side dish to have on your train ride. Happiness comes in mini size too. Grab on this thali which comes with seasonal veg (100g), dal (100g), rice (150g), roti (3 pcs), salad packed in WOW BOX. The dishes are made with clean and healthy ingredient. Be ready to taste an amazing assortment of paneer veg (100g), seasonal veg (100g), dal fry (100g), rice (150g), roti (4pcs), salad and pickle packed in WOW BOX. The dishes are made with clean and healthy ingredients. This authentic Jain Thali is prepared without onion and garlic. It comes with paneer veg (100g), seasonal veg (100g), dal fry (100g), rice (150g), roti (4pcs), salad and pickle packed in WOW BOX. The dishes are made with clean and healthy ingredients. This yummy veg biryani is made with unique and subtle use of spices combined with ghee taste. Cooked with mix and fresh seasonal veggies. A simple version that is way too good and will appear regularly on your menu. A perfect balance of veggies, rice and spices. Served with raita and packed in WOW BOX. Combos are balanced and complete meal. The dishes are made with clean and healthy ingredients. Our combo has paneer butter masala (150 gm) and 3 butter roti. Be ready to taste this scrumptious delight on your journey. Combos are balanced and complete meal. The dishes are made with clean and healthy ingredients. Our combo has jeera rice and dal fry. Be ready to taste this scrumptious delight on your journey. This is a mouth-watering sweet. Gulab jamun (2 pcs) is a delightful treat for your taste buds. Get ready to indulge. Khakhra cravings ONLY from PDS Foods Round, thin and very crispy in texture, these Methi and Achaari Khakras are truly yummy. A traditional favourite. These special crisps from the restaurant promise all the goodness of fenugreek or tangy pickle in each and every bite. Have them with curd, chutneys or jam. It been the restaurant best-selling item since years. The vacuum packing makes it for a perfect takeaway. In case you want to take some tasty bites for your home.